Description: PC2 polycarbonate honeycomb exhibits a unique cell structure. The core has 3 orientations vs. the 2 orientations common with other honeycomb, making its properties more uniform. Each cell has a tubular form and is inherently stable. 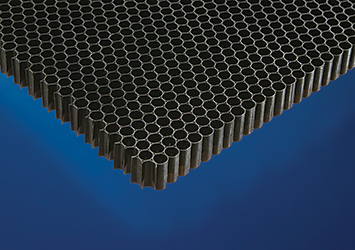 Applications: PC2 polycarbonate honeycomb uses include wind tunnels – grilles, sandwich cores, radomes – antennae, skylights, energy absorbing structures and EMI/RFI shielding. PC2 polycarbonate honeycomb is available in the following standard dimensions. NOTE: Special colors, dimensions, cell sizes, shapes, tolerances and mechanical properties can be provided upon request.